A huge asteroid is travelling towards Earth at 22 miles per second - and is due to miss the Earth by just 300,000 miles on Halloween (October 31), say scientists. By astronomical standards, that is frightfully close. But scientists say there is no need to be scared, even on Halloween. The space rock, which is the size of four football pitches, will remain further away than the moon. There is no chance of the asteroid hitting the Earth for the next 100 years at least, and it is not included in the European Space Agency's official list of potentially threatening NEOs (near earth objects). 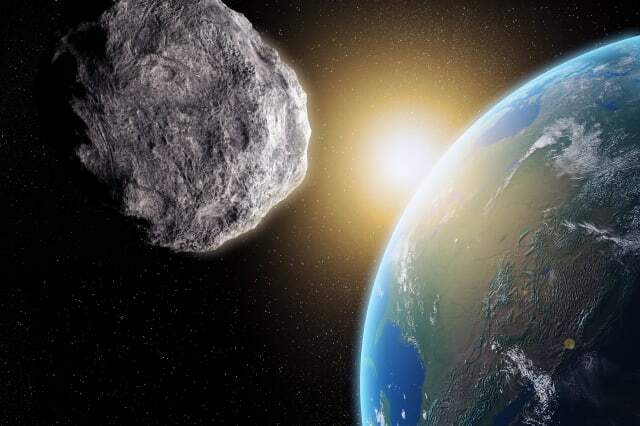 Even so, Dr Detlef Koschny, who heads the agency's NEO tracking team, said: "The fact that such a large near-Earth object capable of doing significant damage if it were to strike our planet was discovered only 21 days before closest approach demonstrates the necessity for keeping daily watch of the night sky." The 400 metre-wide asteroid, given the official designation TB145, was spotted by astronomers in Hawaii on October 10. It is due to fly past the Earth at around 5pm, UK time, on October 31. Very little is known about the object, other than what scientists have been able to infer from observations made so far. Dr Marco Micheli, an astronomer from ESA's NEO Co-ordination Centre in Italy, said: "The diameter of about 400 metres has a large uncertainty, as is usual in cases of any object for which we do not yet know details, such as its composition." More accurate information will be obtained once the object has been tracked by radar, he added. Scientists estimate there to be around 5,000 NEOs of similar size hurtling through Earth's region of the solar system, a significant number of which have not yet been discovered. To watch out for them, ESA is developing automated "fly-eye" telescope technology which should be ready for testing at the end of next year. "Objects of this size are often spotted by automated surveys," said Dr Koschny. "The only difference is that, being so large, they are often found when they are quite far away, out to 2.5 times the sun-Earth distance, and not just before a close approach, as in this case."